The origin of the term ‘Lorraine’ came from the Lorraine region of France; the term ‘Quiche Lorraine’, on the other hand, originated from English-speaking countries. 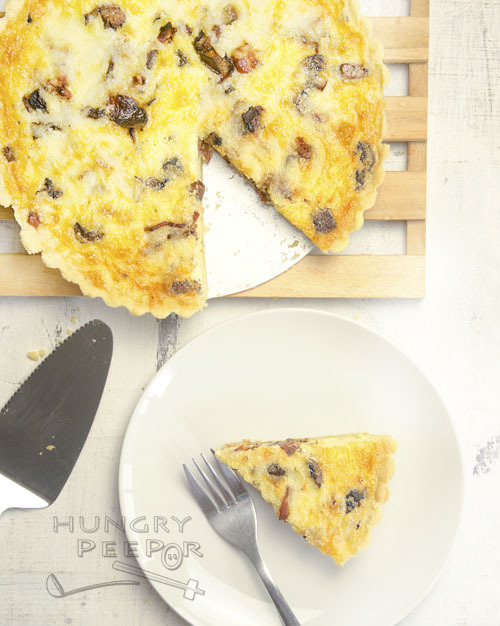 Basically Quiche Lorraine refers to an open pastry that is made of a crusty base and which contains beaten egg as the main filling, as well as other types of filling such as seafood, vegetables, mushrooms and cheese. It is a very popular dish to have everywhere, not just in the Western side of the world, but also in regional countries like Singapore. Savoury tarts have become my frequent choice ever since I gave birth to the boy. Strangely, my tastebuds have changed from a sweet to savoury one. 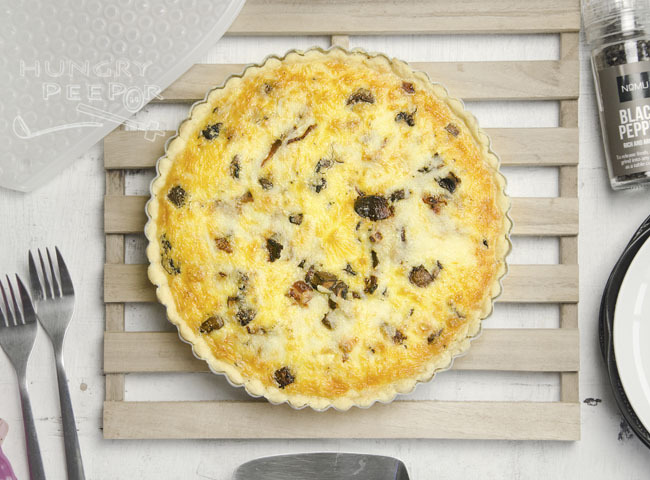 I no longer crave for the sweet tarts, desserts or cakes, preferring instead to dig into savoury ones, especially those with cheese, which makes quiche lorraines the perfect dish made just for me. It is also one of my most regular options for lunch at Starbucks or Coffeebean because it’s light and easy to stomach – a good option to have alongside my hot cup of latte. And that reminds me, I haven’t been to my favourite branch of Starbucks for the longest time. It’s time to go back soon, after all these craziness at work ends! Combine plain flour, a pinch of salt, butter and 1 egg yolk. Knead to form into a ball of soft dough. Rest 20min. Flour pastry pan. Line pan with pastry dough. Chill 20min. Blind bake for 7 min. Remove blind bake and continue baking for 5min. Set aside. Grill smoked bacon till crispy. Dice into small bits. Set onto base of baked pastry case. Cook mushroom in remaining bacon fat for 2min. Remove from heat and set on top of bacon bits in pastry. Whisk together heavy cream, 2 egg yolks, 3 eggs, a pinch of salt, nutmeg and blackpepper. Place mushroom and cheese on top of bacon in pastry case. Pour in whisked mixture. Bake 40min till golden brown and not so wobbly in the middle. Stand for 5min before serving. 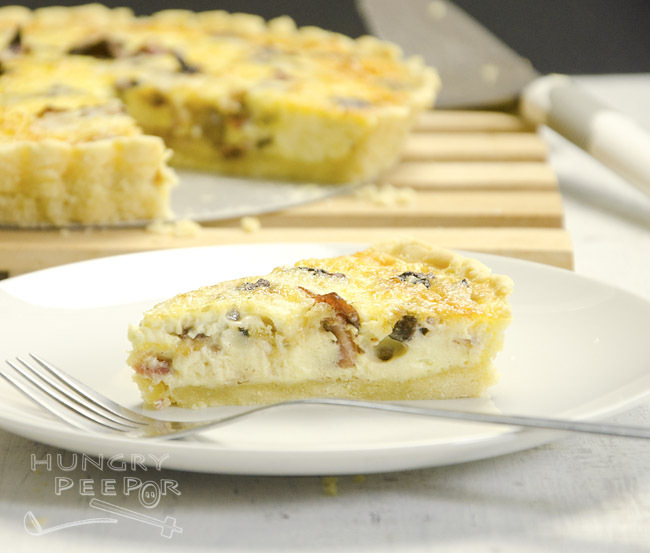 This entry was posted in French, Pastry and tagged Baked, Cheese, Egg, Mushroom, Quiche. Bookmark the permalink.